I told you I wanted to try this new design trend, so on Sunday, while my husband was trying to get our wireless internet working for the PS3, I took everything off the shelves and got to organizing… by color! It took lots of arranging and rearranging and a bit of donating to get it right. I’m sure it will continue to change and evolve as new books are bought and old ones donated. 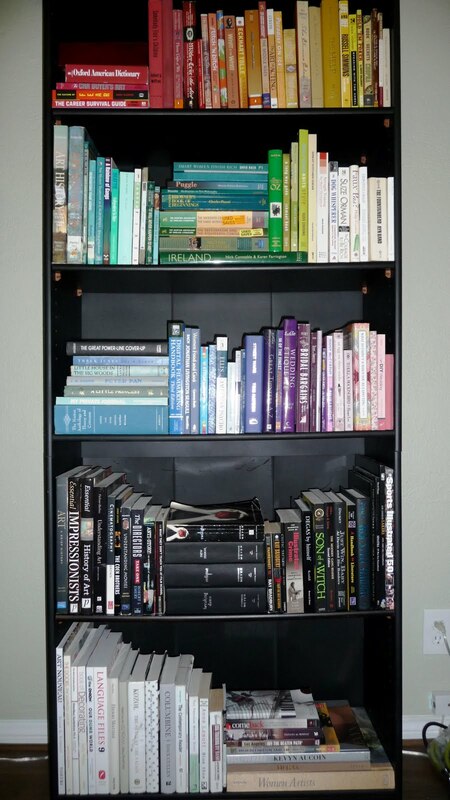 I’ve love to get another bookcase like this one and have them side-by-side to create a wall of books. Then we would have room for some colorful accessories to be displayed among the books. The post I wrote about my reading list for our trip got so many responses I’m going to keep adding to my current list (thanks for the good suggestions) and write up another post about some more books I hope to read. Then, when I get back, I will do my own reviews and let you know what I thought! I wish I had a kindle or nook or ipad. My suitcase is going to be pretty heavy with all these books! so cute! i can't believe the difference… now only if i had the space to do that too. next house. next house. This looks so great! I really want to try with my books!